Several years ago when I was spending a lot of time on the road and in the field in search of home distilled liquors, I pulled over in Baltimore to take a call from documentary filmmaker Kelly L. Riley. 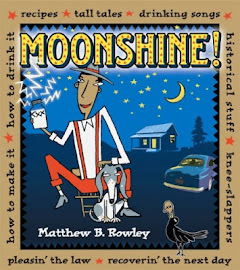 Riley was director of Moonshine. (note the period — it comes into play in the narrative), a short documentary about distiller Jim Tom Hedrick who makes and consumes moonshine in the North Carolina mountains. Riley and I never did meet up in person, but we compared a few notes and he sent me two VHS copies of his film. One I gave to John T. Edge, director of the Southern Foodways Alliance at the University of Mississippi since it seemed like the kind of thing that ought to be shared and preserved. The other I kept and watched with many nods and smiles as I recognized familiar distilling methods, accents, and distillers’ outlooks, even if the people were new to me. Though Jim Tom Hedrick is ostensibly retired from the distilling scene, that’s just the cover story — and a thin one at that. 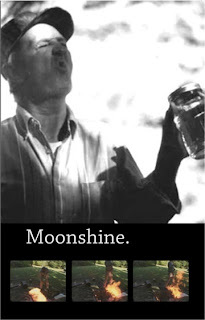 Moonshiners' secret: few of them ever really retire. They just become more secretive or make less often, but distilling is hard bug to shake. Jim Tom looks completely at ease talking about making liquor, drinking it, scrounging parts for his stills, Jesus, and blowing into his truck’s built-in breathalyzer to make it start. That’s right: Jesus. In the clip below, sidekick Gilford Williams holds forth on the role of ethanol in the time of the Nazarene. Take this backyard philosopher with a grain of salt…or a dose of honey. The recipe he gives for his father’s cold remedy is one I’ve found from New England to California. Both Moonshine. and its follow-up Still Making Moonshine are available now on DVD. How to Hit the Sauce, a look at Gabe Evans with his own takes on alcohol as the inestimable How to Batman! My Culinary Library: What Good Does It Do?